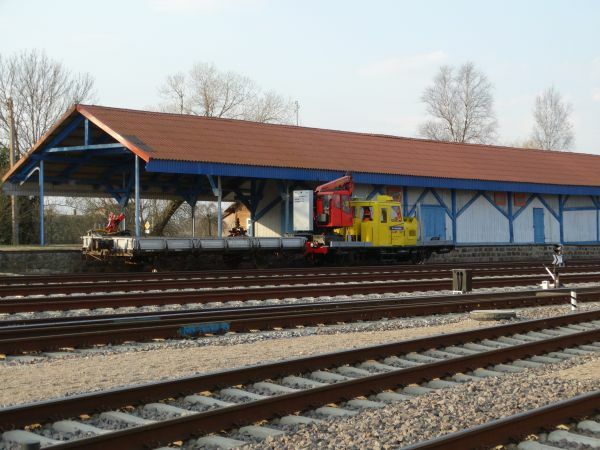 This is the gauge change and reloading station in Šeštokai close to the Polish border, where a new 1435 mm standard gauge line ends and Russian broad gauge 1520 mm begins. To the right of the picture is 1435 mm European normal gauge and closeby is the border to Poland. Picture in Šeštokai 2.4.2017 by Ilkka Siissalo. 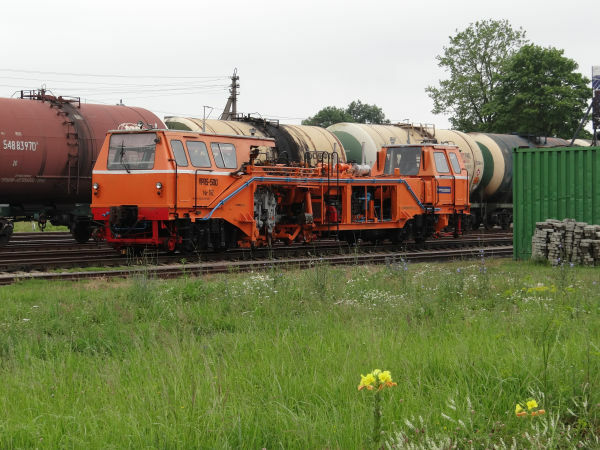 Normal gauge 1435 mm on the left, Russian 1520 mm gauge on the right. Reloading in Šeštokai. Picture at 2.4.2017 by Ilkka Siissalo. 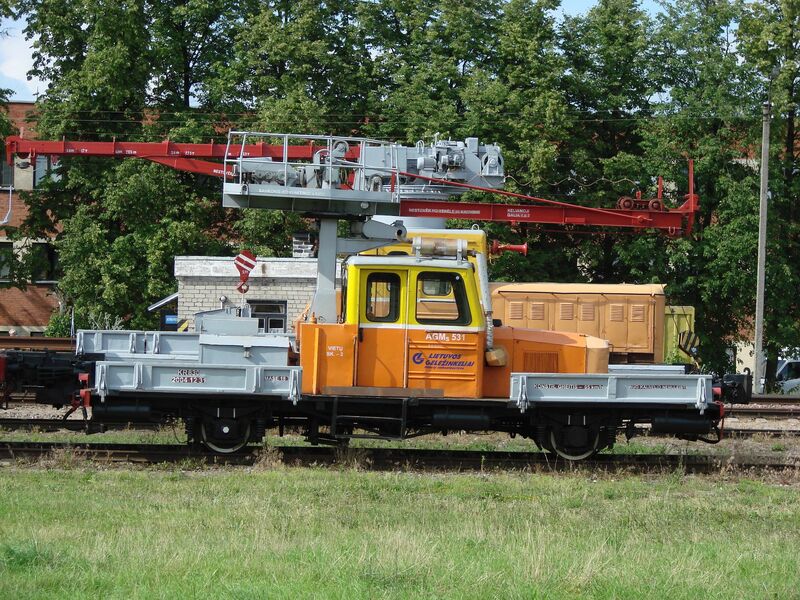 A class AGM rail truck used in moving new rails while building the new 1435 mm Rail Baltica line. Picture at Šeštokai 2.4.2017 by Ilkka Siissalo. A closer view of the same AGM rail truck. Picture at Šeštokai 2.4.2017 by Ilkka Siissalo. An AGMs, an AGM rail truck fitted with a crane. Old Soviet time tool, but already repainted and fixed. Picture 4.7.2007 in Panevėžys by Ilkka Siissalo. 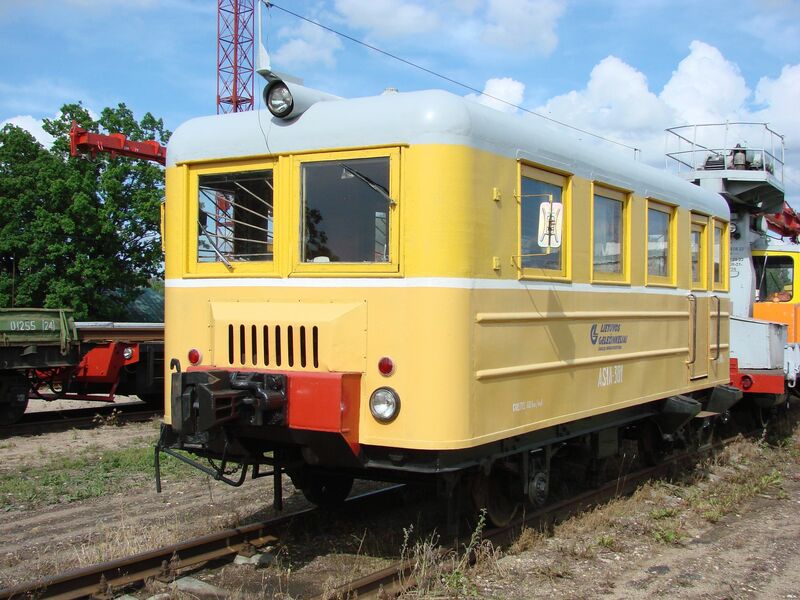 An old motor wagon, for transporting rail workers or for rail inspection, class AS-1A. Picture 4.7.2007 in Panevėžys by Ilkka Siissalo. An old motor wagon, for transporting rail workers, class AS-1A. Picture 4.7.2007 in Panevėžys by Ilkka Siissalo. 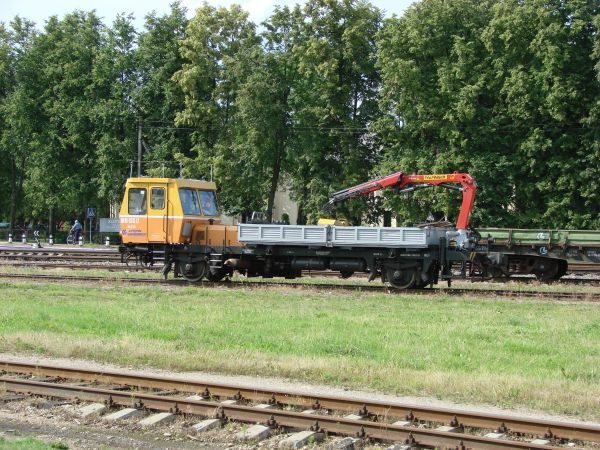 A modern Western European rail truck, LG's type WM-15S, built by ZNTK Stargard in Poland. Picture 4.7.2007 in Panevėžys by Ilkka Siissalo. 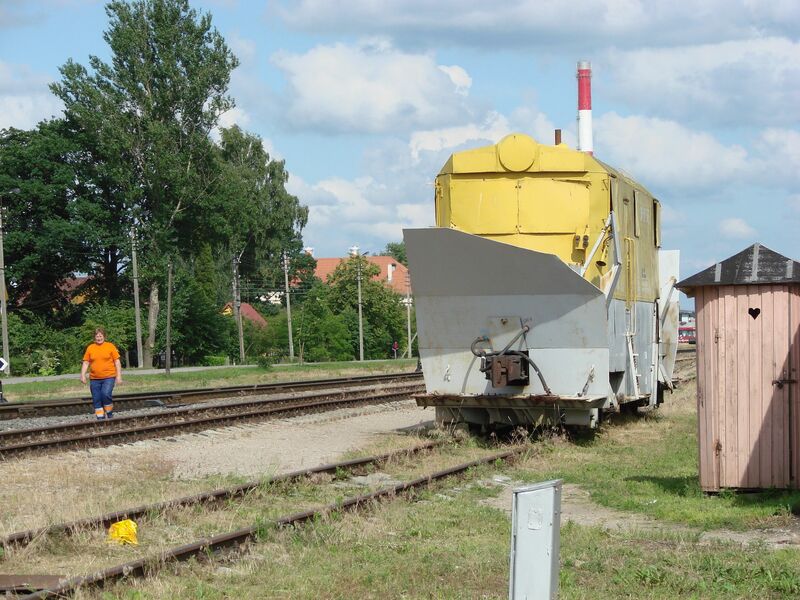 What a snowplough ! Picture 4.7.2007 in Panevėžys by Ilkka Siissalo. 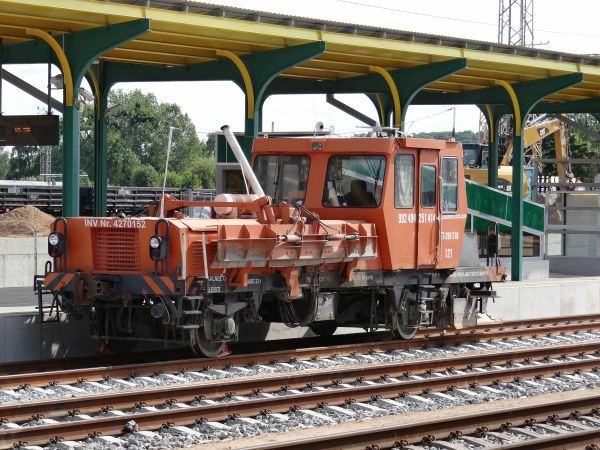 An old class M62K locomotive parked at the station of Šeštokai close to the Polish border, where a new 1435 mm standard gauge line is being busily built towards the north, paid by the European Union project Rail Baltica. Today Šeštokai is still the gauge change / reloading station between normal gauge and Russian broad gauge 1520 mm. Picture in Šeštokai 2.4.2017 by Ilkka Siissalo. 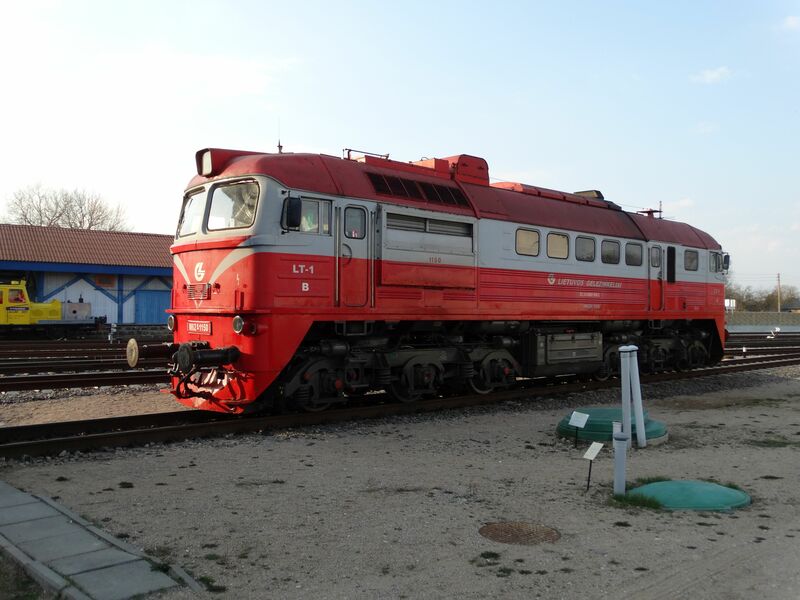 A closer look at the same locomotive as above. If you look at the picture closely and if you happen to know Russian / ex-Soviet railroads, you might notice from the picture that there's something odd here. Namely there are buffers at the front. These are never used in the Russian system. There is also the text "LT-1" at the front and rear of the loco. 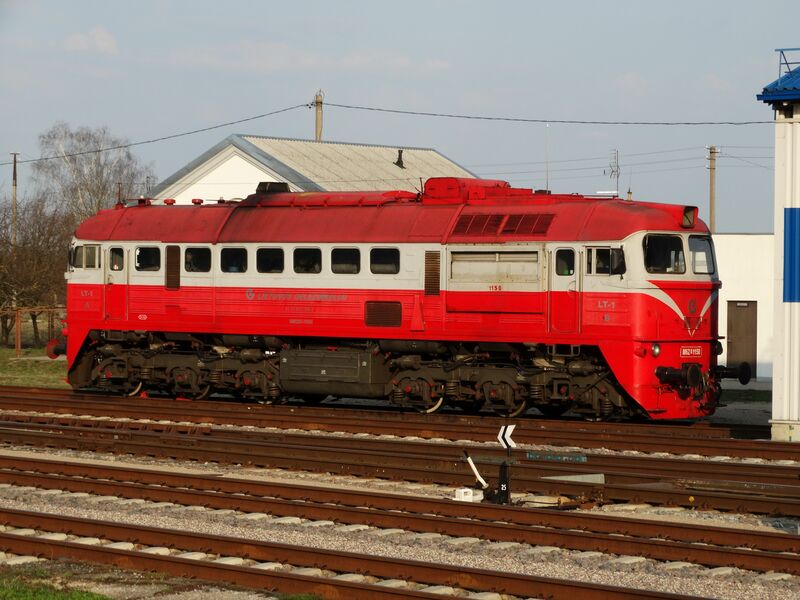 This is an absolute rarity, a Lithuanian normal gauge 1435 mm locomotive, used in building the famous Rail Baltica normal gauge rail connection. Picture in Šeštokai 2.4.2017 by Ilkka Siissalo. A class DGK rail crane, right from the Soviet socialist times. 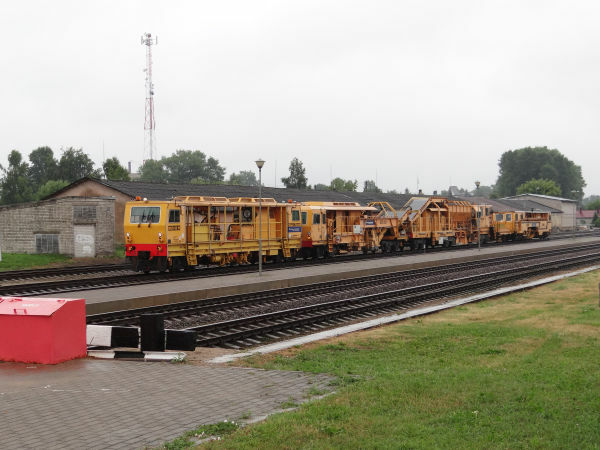 Picture in Jonava 26.6.2015 by Ilkka Siissalo. Another class DGK rail crane. Picture 4.7.2007 in Panevėžys by Ilkka Siissalo. It looks pretty wild, doesn't it? 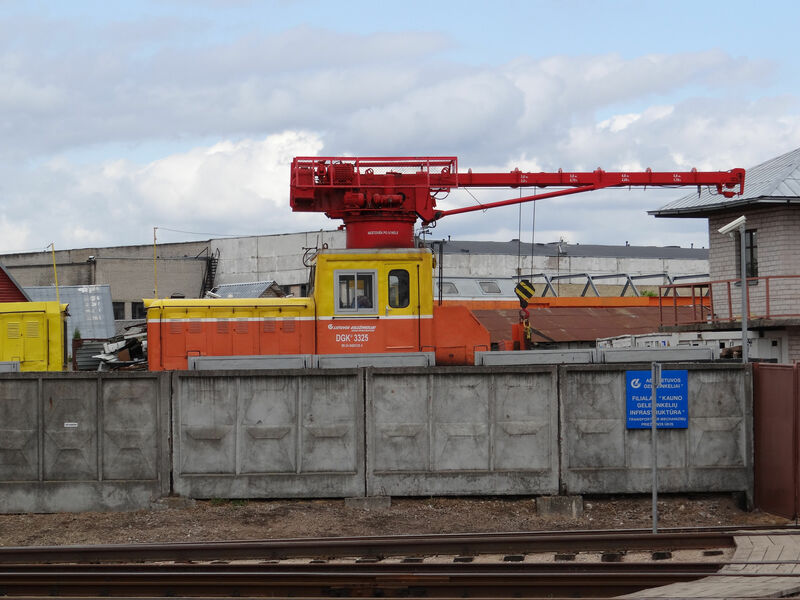 It's a socialist style class DGK rail crane heavily modified to become a catenary wire installation and inspection vehicle. 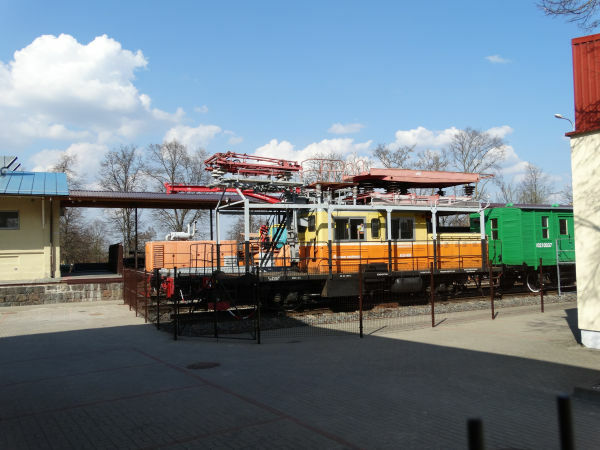 Picture from the railway museum at Vilnius station 2.4.2017 by Ilkka Siissalo. 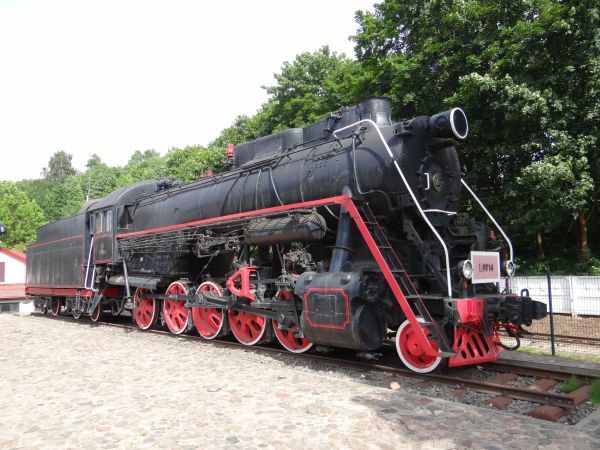 A class L steam locomotive from the times of the Soviet Baltic railways, now a monument. Picture in Vilnius 2.4.2017 by Ilkka Siissalo. 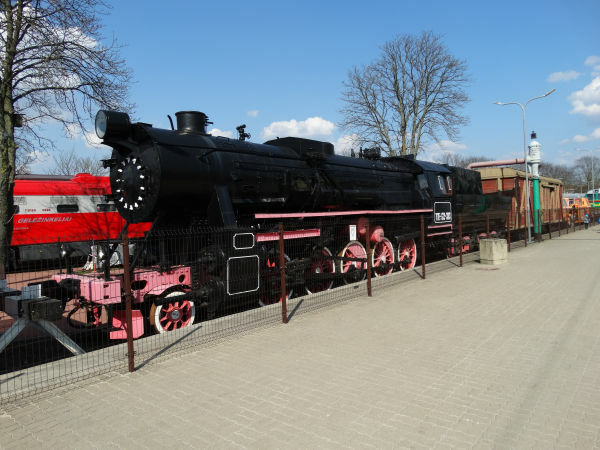 There's another class L steam machine as a monument in Kaunas, about a kilometre from the station. Also here the original Russian cyrillic letterings have been replaced by latin characters. Picture in Kaunas 26.6.2015 by Ilkka Siissalo. This is a German Kriegslokomotive, war locomotive of Hitler's army, Baureihe 52, which the Russians either called class TE or the German style just 52. It has received a new boiler and some other modifications. 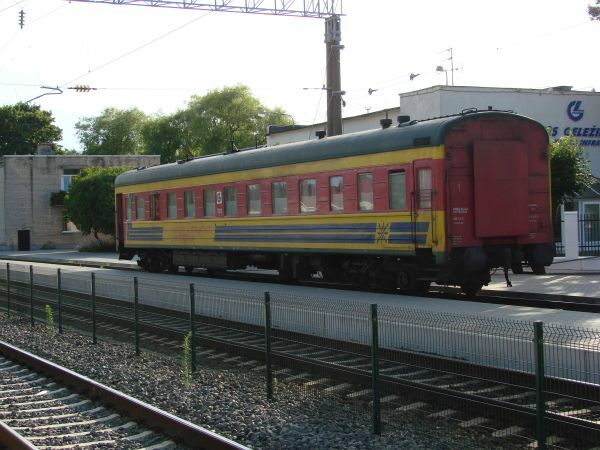 It has "TE52" paintings on its sides, which in real life were never used. It was either "TE" or "52" like in Estonia. 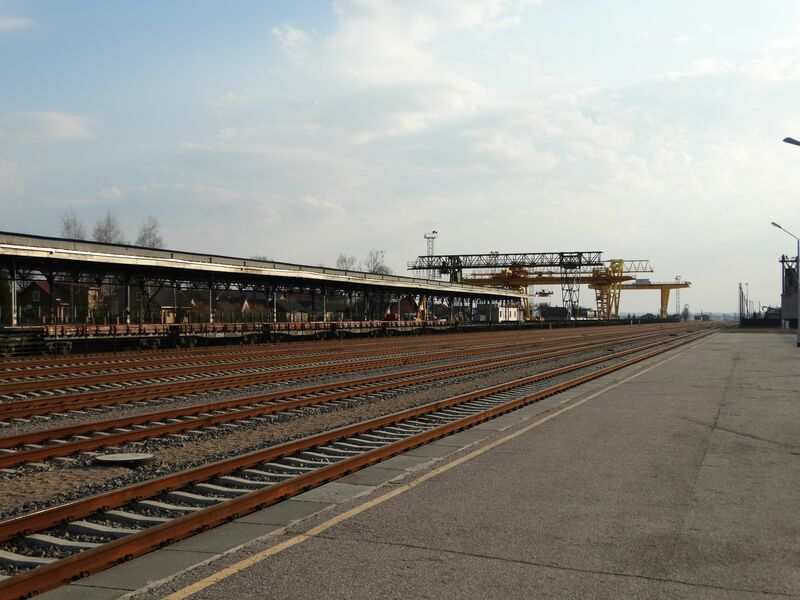 Picture from the railway museum at Vilnius station 2.4.2017 by Ilkka Siissalo. Another view of the same German Br52 Kriegslokomotive. 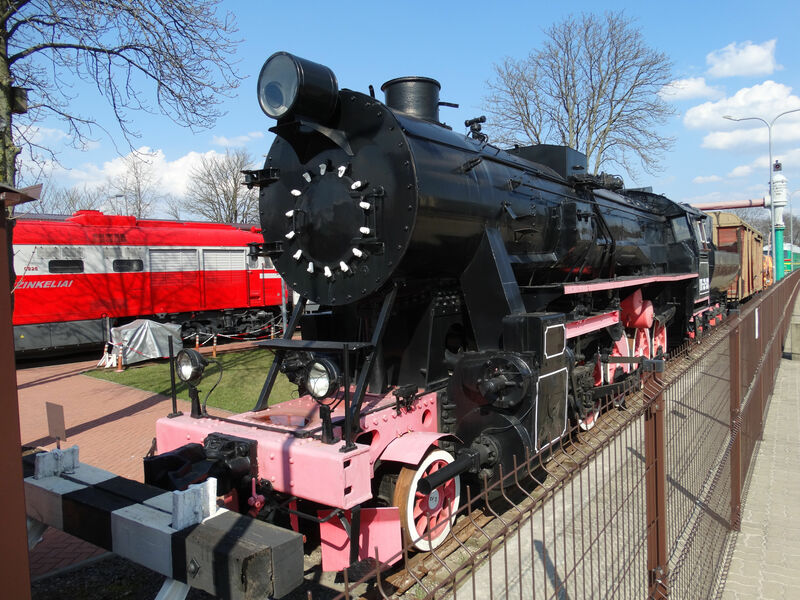 The lamps are new, it misses its buffers, it has a new boiler, but other than that, it is an original war locomotive of the German army of WW II. 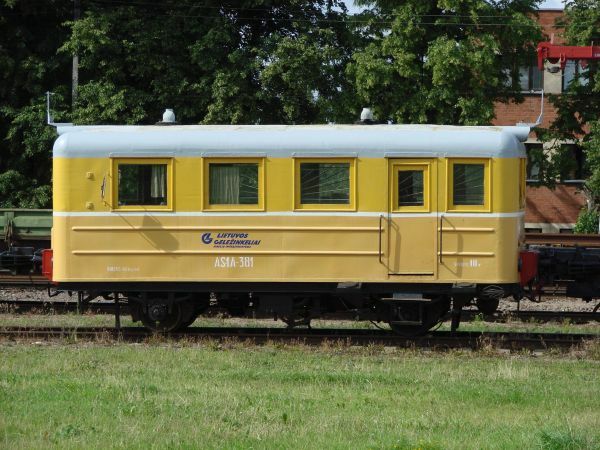 The closed back of the cabin with its door tells that this is one of those Br52 machines purposefully built for the extremely cold Russian winters. Many were left behind, for the use of the Soviet Union. 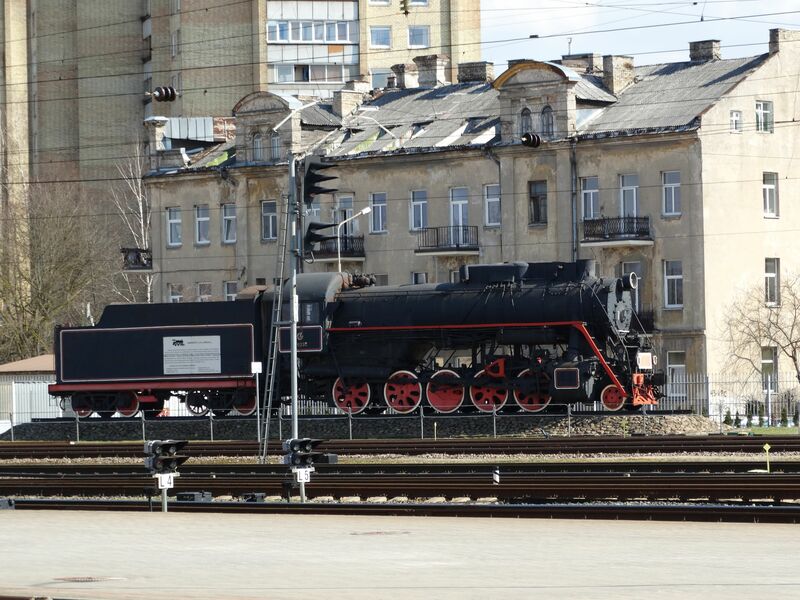 Note the classic war locomotive Wannentender, bath tub tender wagon. Picture from the railway museum at Vilnius station 2.4.2017 by Ilkka Siissalo. This is an authentic Soviet Russian postal wagon from the USSR times. 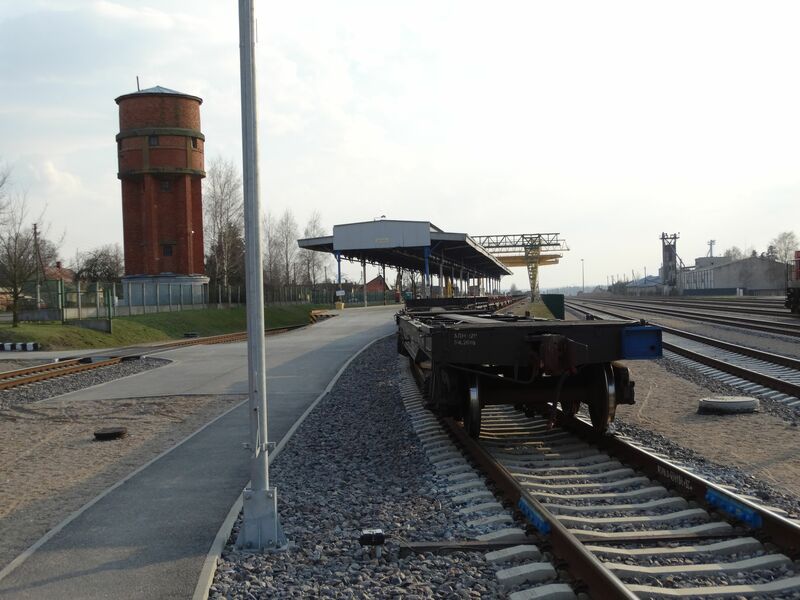 Picture from the railway museum at Vilnius station 2.4.2017 by Ilkka Siissalo. 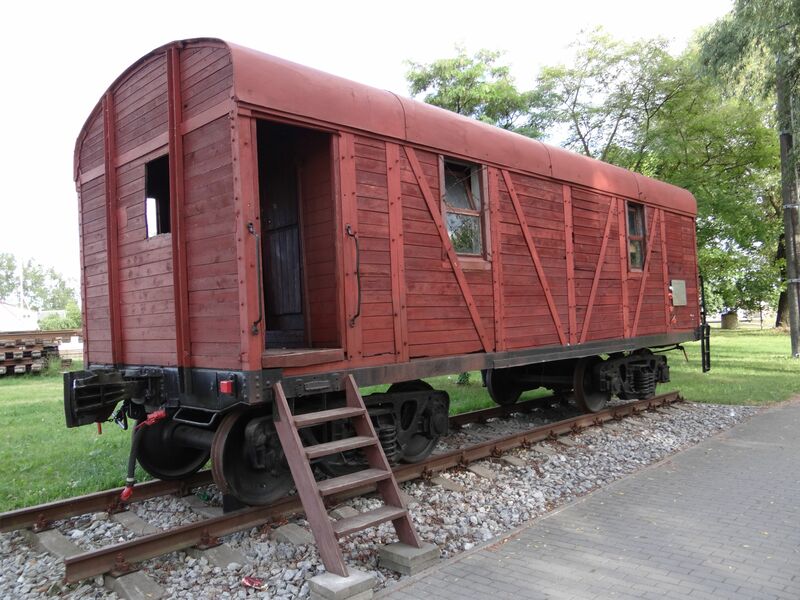 Stalin's prisoner wagon from the USSR times. 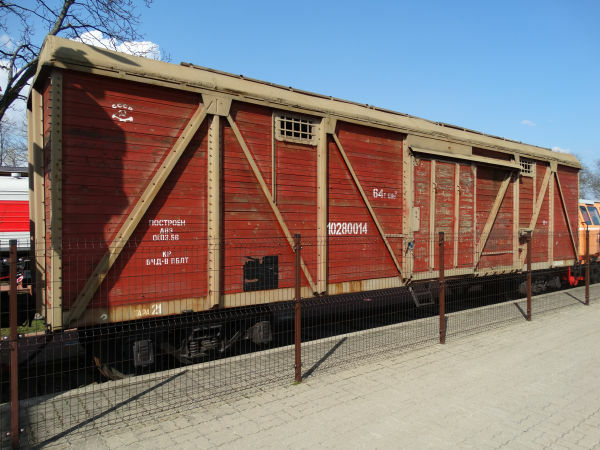 During Stalin's rule 132 000 people were sent from Lithuania alone with these prisoner coaches to forced labour camps in Siberia and elsewhere in Russia. Very few survived those "Gulag" camps. This wagon is kept as a sad reminder of the past at Marijampole. Picture by Ilkka Siissalo 26.6.2015. 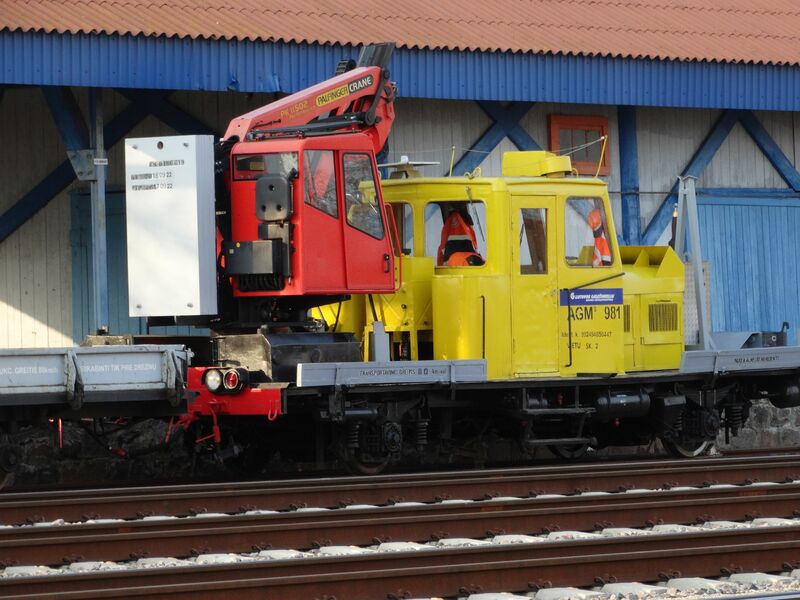 This is a PT-800 modern tamper machine made by the Austrian company Plasser & Theurer. Picture in Kaunas 26.6.2015 by Ilkka Siissalo. 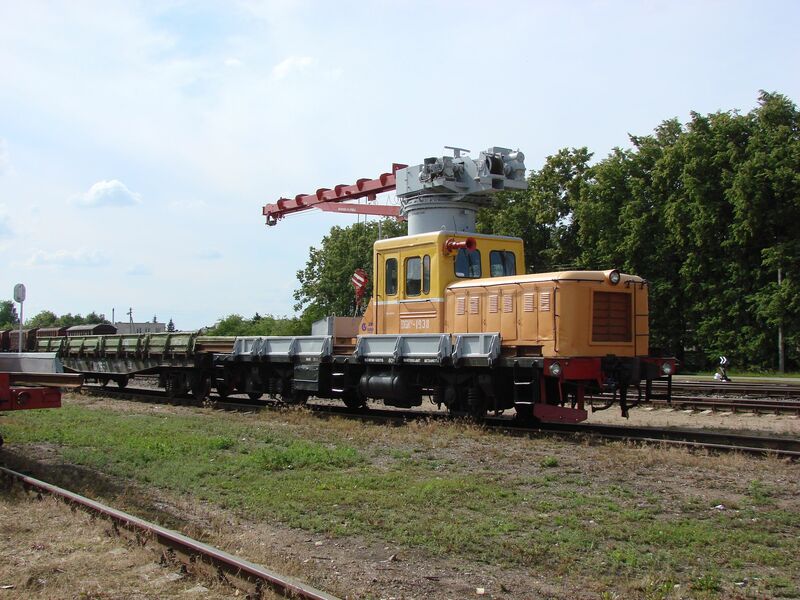 A ZT-250 rail truck with ballast gravel handling equipment. Picture in Kaunas 26.6.2015 by Ilkka Siissalo. An interesting combination of Plasser & Theurer track maintenance equipment. 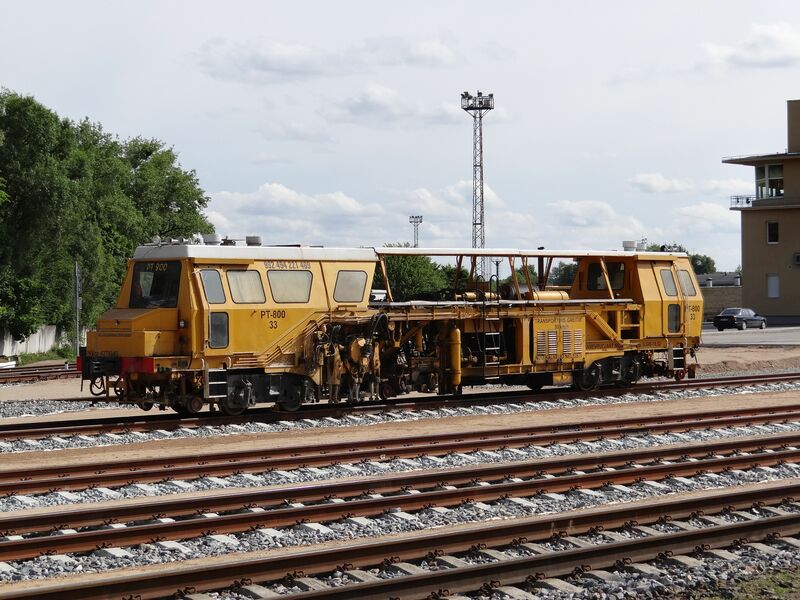 These are for taking up much of the old ballast, washing it, spitting it back and then retamping it. Picture at Jonava station 28.6.2013 by Ilkka Siissalo. A tamper machine VPRS-500 made by the Austrian company Plasser & Theurer, here at Mauručiai 28.6.2013. Picture by Ilkka Siissalo. 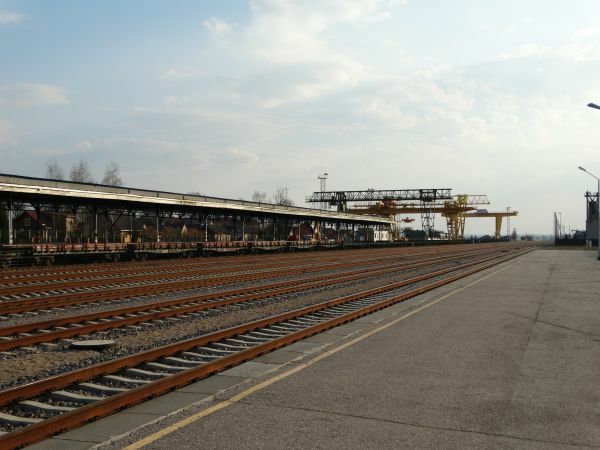 A rolling measurement laboratory intended for controlling track geometry. Picture at Kaunas station 4.7.2007 by Ilkka Siissalo.